This is the first of a four part series on vehicle safety, inspired by articles found in digitized historical newspapers from across Huron County. Many of these newspapers can now be accessed by visiting our website. The story of vehicle safety is protracted and involves many actors. In this series on the history of vehicle safety, Special Project Coordinator Jeremy Dechert will shed light on particular vehicles and vehicle components which were discovered to be dangerous through either design flaws or negligence. 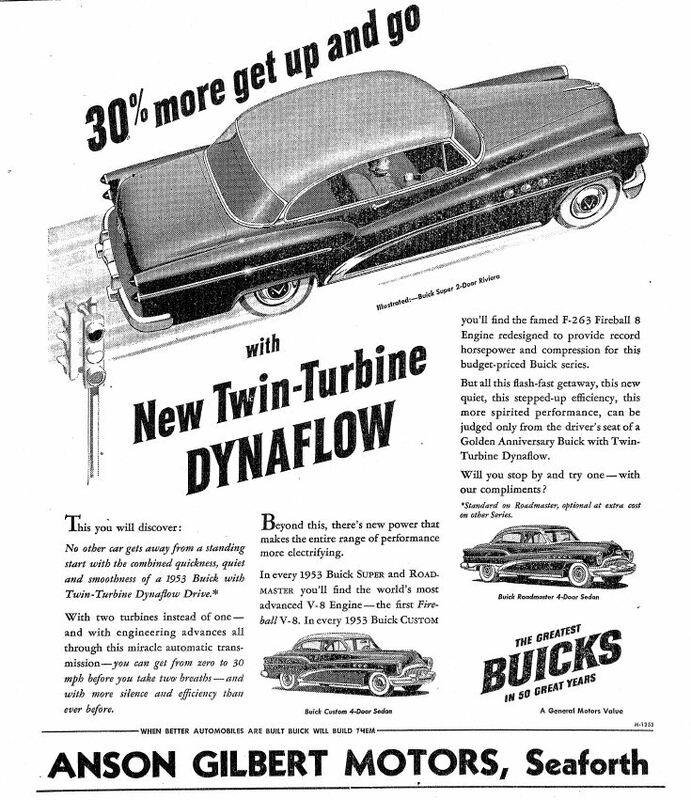 According to the above advertisement for the 1953 Buick Roadmaster, “all this flash-fast getaway, this new quiet, this stepped-up efficiency, this more spirited performance, can be judged only for the driver’s seat.” I disagree; this car can also be judged by those who have never driven one. On January 18, 1954, Leon Friend drove his 1953 Buick Roadmaster to the Lawless Buick Company in Ferndale Michigan for service. The previous day he had experienced a total loss of braking power. Clifford Wentworth, the assistant service manager, was pulling Mr. Friend’s car into the garage when the brakes failed yet again. Unable to stop, Mr. Wentworth crushed the leg of mechanic Robert Comstock between the Buick and another vehicle he was working on. Comstock lost his leg as a result of his injury. The negligence of General Motors in dealing with the ‘53 Roadmaster’s known braking issue was highlighted during the course of the lawsuit brought by Comstock and his workmen’s compensation carrier against General Motors and Clifford Wentworth, the assistant service manager. The Roadmaster’s hydraulic breaking system had faulty ‘o’ rings. The ‘o’ rings acted as a seal between the master cylinder and vacuum cylinder of the power braking system. Because they created a poor seal, brake fluid would be sucked out of the braking system and up into the engine where it was burned off. With the brake fluid depleted, when the brakes were engaged the amount of pressure required to stop the vehicle could not build up in the brake lines. Wentworth testified that General Motors was aware of the braking issue problem with the Roadmaster by November of 1953. Garages were told to fix the problem when vehicles came in for service. However, Buick’s Service Department advised garage operators not to preventatively warn known Roadmaster owners of the danger they faced. Only if an owner brought their vehicle in for service were garage mechanics were to fix the issue. Further, if a Roadmaster owner did bring their vehicle in for service but the garage did not have the parts to fix the braking issue, the garage owner was pressured by General Motors not to inform the vehicle owner of the issue. Comstock lost the case in circuit court but upon appeal to the Supreme Court of Michigan, he was granted a new trial. However, before the re-trial began, GM settled the case out of court to the tune of $75 000. This example of negligence was featured in Ralph Nader’s 1965 book Unsafe at Any Speed, an explosive exposé on safety standards in the automobile industry. This work changed the nature of vehicle safety in North America. *Details for this story were taken from Ralph Nader’s book Unsafe at Any Speed, 1965.